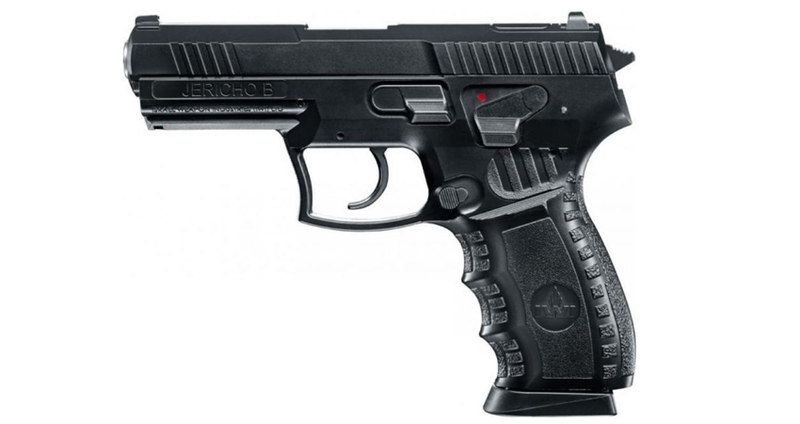 The IWI Jericho B is the first Umarex CO2 replica of a pistol from Israel Weapon Industries. It’s based on the IWI 9mm service pistol and features a movable metal slide (but no blowback), a working safety-catch, 16 round magazine. heavy metal slide. Authentic safety lever. Double action trigger. Umarex presents a CO2 replica of a well-known Jericho B pistol replica. The manufacturer is known for cooperation with firearms manufacturers and this time they received full IWI (Israel Weapon Industries) license too. Thanks to that the slide and the frame are decorated with real firearm markings, the same as on the regular IWI pistols. There's a 22mm RIS rails mounted under the barrel, which make it able to equip your replica with various attachements. The Jericho is also equipped with double-sided magazine release and rotary safelock on the right side. Pistol lock locks in a rear position and is equipped with working lock release. Both the 12 gr CO2 cartidge and the 6 mm BBs are housed in the metal removable magazine.